Buying engagement rings online is easier than you think but can be daunting if you don't know what to look for. This is usually the case for most people because they only buy an engagement ring once and have no experience with finding diamond engagement rings or even loose diamonds online. Buying diamonds, rings and diamond jewelry online is safe, easy and provides you excellent value. There is some basic knowledge that you should have before starting out looking for diamonds and jewelry online because of the value and importance of the items you will be purchasing. We have provided an overview of the online diamond ring shopping process and what you need to look for when buying engagement rings online. One of the first thoughts that comes to mind is how safe it is buying an engagement ring online. With today's security features and updated, more secure browsers, it is very safe to purchase diamonds, rings and diamond jewelry online, just as it is for almost any other product. It is more important that you trust the retailer that you are working with and ensure that they are reputable online stores. Novori Jewelry has been online since 2004 and is listed with the Better Business Bureau. We provide all our contact information online including our address, to ensure that you can reach us when you need to. We have thousands of satisfied customers that have purchased from us in the past. We also provide a 30 day return policy to give you the opportunity to feel comfortable with your purchase without any risk. It is safe to purchase an engagement ring online - when you are dealing with a reputable online jewelry retailer like Novori Jewelry. So here is what you absolutley need to know when you are looking to buy that special ring online. You will find that you will save a lot of money and that you can keep these savings, or buy a larger, nicer diamond to make the ring look more grand. The basics to buying rings online is to find a reputable jeweler like Novori Jewelry, who will stand behind the products they sell. Set yourself a realistic budget for your purchase. Even an approximate number will help you determine what style and diamond size you should be looking for. Find your diamond, then find your setting and let us do the rest. It's just that easy to buy your engagement ring on the internet. Here are some details for each step of the process. Before you start buying an engagement ring online, you should set a budget or guide for how much you want to spend. When looking at diamonds and rings it is always easy to spend more on a diamond or ring than you had planned. Set a budget and try to stick to it. Engagement rings online are easy to purchase because you will save money when shopping online. Online retailers do not have the overhead of large fancy stores and commissioned staff to pay for. You can expect to save 40% to 60% when you buy a diamond or an engagement ring online from Novori. And it's easy to check and compare prices. 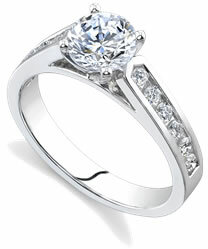 At Novori Jewelry, all our diamonds and ring settings are value priced at our lowest prices possible to save you money. Saving money is just one of the benefits of buying an engagement ring online. Ensure the diamond is a real, natural and non-enhanced diamond. Novori only sells natural, real and independantly certified diamonds. Enhanced diamonds have been modified with expoxies and glues to attempt to make them look better than they are. These procedures won't last and you end up with an almost worthless stone. Real, natural non-enhanced diamonds provide lasting beauty because they will never fade or loose their brilliance. When buying diamonds online, you might want to call for assistance. At Novori, we always have a diamond expert available to help you. We will also review any purchase made to ensure you will be pleased with the diamond you have selected. You can easily select a certified diamond from our extensive list. Our diamonds are also ethically mined and are non conflict diamonds. We require all our sources of diamonds to support ethically mined diamonds from the source. All our diamonds are certified from an independant laboratory and you receive the certification certificate with your ring. The important thing to look for when buying diamonds online is that it is a natural, independently certified diamond within your budget. The next step is to select a setting style that she will love. Perhaps she has been providing you hints on the style she likes. Check out the styles shown above and click on an image to see more of that style. At Novori we have hundreds of settings choices. A ring setting with side stones or a solitaire ring. White gold settings (most popular) or yellow gold rings. Platinum or 14k gold or 18k gold settings. These are all factors when selecting a ring but you will probably have a good idea for these based on the jewelry she already wears. With an engagement ring, try to keep to a style she already wears and loves. Maybe it's just as easy as asking her for advice. She may be looking as well! If you need help, just remember than Novori is here to assist you with any questions you have. You can chat with us or call us toll free at 877-877-4141 when its convenient for you. It's quite easy to purchase an engagement ring online. At Novori Jewelry we make it easy and handle the details for you. We can help you select a diamond, select a setting and have the perfect engagement ring sent to you fully insured to your door. Best of all you will have a quality ring made in the USA and save 40% to 60% from a jewelry store price. Hopefully this has helped you and we are always ready to assist you. You can chat with us online or call us toll free at 1-877-877-4141.